It looks like Best Buy has decided to take a stab at converting at least 60 of their stores to a format that is very similar to that of Apple’s retail stores—a sleeker, more open layout that focuses on a few key products rather than hundreds of products crammed together on obnoxious product shelves. Of course, this new plan isn’t as harsh as closing complete stores like they have been doing, but in my opinion, it’s a longshot at making an attempt to save the company. The new stores will reflect the idea of simplicity that Apple has adopted over the years, which is fine except that Apple only sells three major products and filling an entire storefront with the few variants of these items was more of a necessity than an idea. Best Buy on the other hand not only sells these same Apple products, but thousands of other competing products and their many accessories. With that said, it should be interesting to see just how the new layout will look and who will get the coveted floorspace. Best Buy also says it plans to refrain from forcing customers to wait in potentially long-lines at the registers to pay for items by utilizing wireless technologies that Apple currently uses to ring up customers wherever they are standing. In recent months, Best Buy’s stock has plummeted to around $21 per share, there have been allegations about former CEO Brian Dunn having an inappropriate relationship with a subordinate and now there are reports of Best Buy founder, Richard Schulze is looking to take the company private again. As a former Best Buy employee, I used to receive great full-time benefits, an awesome work environment and a generous employee discount on just about anything in the store. Back in those days, online shopping was around, but many people were still leery about submitting credit card information to seemingly fly-by-night operations and eBay was only known for selling used items via the auction format with Amazon only selling books. The top three electronics retailers at one point were Best Buy, Circuit City and Walmart. As the years went on, I began noticing a certain trend happening at Best Buy stores. The focus began shifting from customer service and keeping employees trained well enough to match their commission-based Circuit City sales people to simply relying on offering services. From a business standpoint, this made perfect sense because services are intangible products with no inventory and limitless potential for generating profits. This new strategy also welcomed the Geek Squad into the Best Buy family and ultimately drove Circuit City out of business. It felt like Best Buy was unstoppable. And then the economy took a dive. People started watching their money more closely and another (far more damaging) trend began to take shape. It first started when customers were literally buying new large-screen tvs for special events and games like the Super Bowl and then returning them a week later to get their money back. This was the case for other “one-time use” products such as camcorders, digital cameras and even laptops. It felt like what the department stores go through when women buy dresses for special occasions and then take them back afterward. These actions gave birth to restocking fees and the inevitable divide we placed between us and the customers. This trend and the perceived demise of customer service led to the current trend of today where customers are now using Best Buy stores as showrooms to play with and experience the latest electronics only to make their purchases elsewhere. In fact, some people even use the Android Amazon Price Checker app to scan products right there in the store to see how much they can save online. I applaud Best Buy for taking steps to keep things afloat and not have to close any more stores which would create the loss of many jobs for people around the country, but I fear that it might be too late. Online retailers like Amazon can get away with cheap prices do to their lack of retail stores. 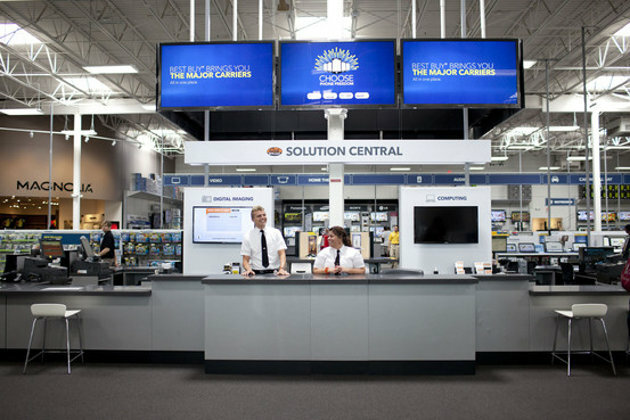 I think that if Best Buy put some more focus into their online store while building out an affiliate program, they can convert most or all of their stores into real showrooms, but instead of losing customers to Amazon, they can lose customers to BestBuy.com. Maybe instead of paying for huge 58,000 sq ft warehouses, they can open up smaller Apple-sized (no pun intended) stores and generate focus on very specific products that can be fulfilled at “online” prices. ← Facebook Stock – Buy, Sell or Wait?